Originally posted last February, this was before I had 6,000 readers a week, so there may be one or two who haven't seen it originally. The Mad Genius Club is going to force me to actually work. I don't mean they're holding a gun to my head, but they are making me up my game with their most recent posting of their year's topics. If they're going to up their game, let's see who can out-blog who. Ha! If you'd been to Cedar's blog last week, you've already read this one. If you haven't ... why haven't you? If you're interested in pacing an entire series, you could do much worse than look at the fantasy novels of Terry Goodkind. In his case, the solution to one, world-ending doom leads to the next world ending doom. 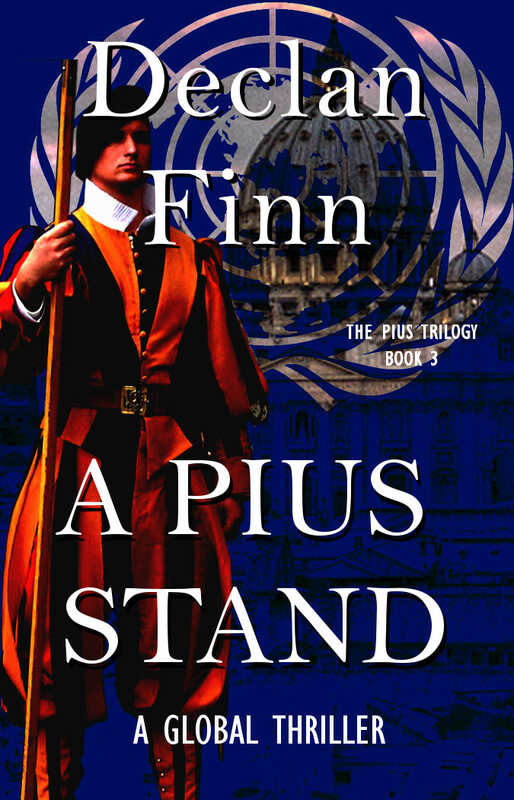 I did that in one series, the Pius trilogy, where book one ends nice and happy and yay the bad guys are gone … then that lead into book two, where the bad guys had a backup plan, which led into causing problems in what would be book three. 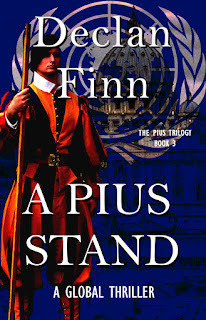 With my Pius trilogy, I take the “machinegun through the door” a little too literal at times. The first chapter opens with a gunman picking up tech expert at Rome's airport, and leads into a body being blown out of a window and landing on their car. Then I reveal that it's the head of Papal Security picking up a Secret Service agent. When I'm not dropping bodies out of windows, everyone has just barely enough time to analyze what's going on before they're attacked again. Or they have a nice quiet conversation about their past, their feelings, their character exposition … did I write that out loud? Oh well … and then somebody is mugging them, or shooting at them, or performing strange gymnastic attacks with a halberd. Yes, that last part is a long story. Read A Pius Man for that one. With my other project, Codename: Winterborn (yes, after the Cruxshadows song), my protagonist, Lt. Kevin R. Anderson has more internal pressures driving him. 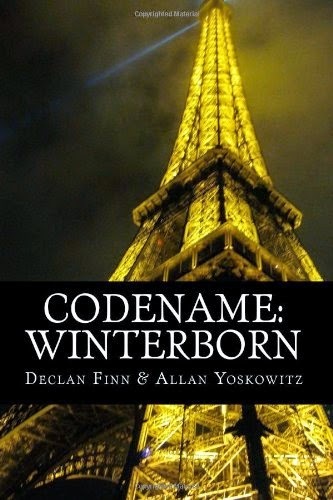 At the opening of Codename: Winterborn, send Kevin and his team of spies into the Islamic Republic of France (the IRF … or the Irritating, Revolting Frogs). Then I kill off almost everyone Kevin likes, because some politicians thought that blowing the cover on his SpecOps team would be just a great idea for political points, and their bank accounts. Except, before he was a spy, Kevin was a Navy SEAL. So, I get to send Kevin on a fun-filled ride of assassinating fourteen politicians. Yay! Oh, wait. Duh! The IRF mission was to take out a nuclear arsenal. With one team gone, another will have to be sent. So, Kevin has to kill all of these little bastards (the politicians) before even more Americans are murdered. That'll throw him into a pressure cooker. Muahahahaha. Hmm. Yes, that's nice and all, but after a while, someone's going to catch on and try shooting back at Kevin. In my world of 2093, it's three years after a small nuclear war (only 2.2 billion dead). There aren't quite as many senators as their used to be, mostly because there are a few states that are radioactive wasteland. When wiping out 20% of the senate, SOMEBODY'S bound to notice. Thankfully, there's a whole Guild of Mercenaries ready to step up – imagine an umbrella organization for every Private Military Contractor out there. Some are good folks just earning a paycheck, some are folks thrown out of other countries because they were too freaking scary to live there. I love Mandy. She's based very slightly off of the Mandy of 24 Seasons 1, 2, and 4 … though mine has a personality. She also has a price on Kevin's head … and there's an internal power struggle going on within the mercenaries, so other mercs have a good reason to have her head at the same time as she's hunting Kevin. Oh yes. This is gonna be goooodddd. Now, we've got Kevin Anderson racing the clock, outrunning Mandy, needing to outwit and outfight truck loads of private contractors standing between Kevin and his target. And did I mention that he's going through full-on PTSD? Okay, they just serve to show that I grew up watching too many action films. At one point, two of Kevin's allies sit down for a conversation about how to best pull his backside out of the fire … but they're complete strangers, so the scene could break out into a shooting match at any given moment. At another point, I go into a deep, intimate scene going through Kevin's psyche through his dreams … but back in the real world, a gunman is pointing a gun at the back of his head. At one point, I go into a deep, intimate scene going through Kevin's psyche through his dreams … but back in the real world, a gunman is pointing a gun at the back of his head. The short version is that the tension needs to stay on for a thriller. The world doesn't need to be in danger all the time. You could make it something as simple as the protagonist's sanity. Then again, with my characters, sanity is optional to start with.